As I have found during my research that when looking for interesting places to go for a daytrip from Barcelona too often results only include the same obvious answers the likes of Montserrat or Portaventura I would like to add to this discussion with some jewels I have explored over the past few years. 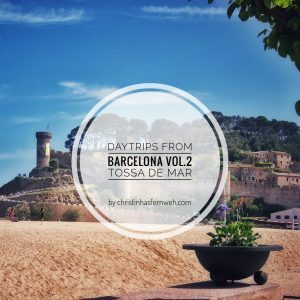 One of those is Tossa de Mar. It is super easy to get to because there is a direct bus from Barcelona’s Estacio de Nord that only stops one more time along the way, in Lloret de Mar. From the stop in Tossa it is a short walk downhill to the beach, through the alleys of the newer parts of town. This how I discovered a fashion store selling clothes and accessories where I found my two favorite broaches. The boardwalk tends to be touristy, lined with restaurants and shops, but the real perl of Tossa is the old town. It transports you back in time, all stone and greenery, no concrete, no cars, no noise. There are some ruins, an old church on the way up and then you´ll see the old city walls, which you can walk on, almost all the way around the old town. When you descend onto the cobble stone roads you´ll find that there are still people living in these houses, and businesses, mostly catering to visitors.Somehow it seems as if time is standing still though. Through quite literally a hole in the wall you can climb onto a terrace overlooking the sea and the town´s beach in the bay right below. The view down is stunning from every side, as the old town is located on a peninsula, surrounded by water on three sides. I went in the spring and recommend that time of year, when the flowers are blooming but before the high season starts on Costa Brava. What places have you visited that took you back in time? The bus company is called moventis, this is the link https://compras.moventis.es/paginas/resultados_trayectos.php enjoy!